Niklas Porsing, seen here leading heat five, was an excellent guest for Panthers against Sheffield. Photo: David Lowndes. What a result. What a meeting. And what a time to be a Peterborough Panthers fan. The city club charged to a thrilling 53-37 success over fellow Premier League play-off hopefuls Sheffield at the East of England Showground last night (July 17). It was the latest in a long line of magnificent meetings at the Alwalton venue this season and another fine victory for a Panthers side continuing to defy the odds due to injury problems aplenty. Joint Panthers team manager Dale Allitt said: “We drew up at Sheffield earlier in the season on a night when we had a lot of breakdowns and felt we should have won. “We were determined to beat them in the return clash and did it thanks to a very good performance and I’m very happy with all the lads. “We also continued our very pleasing habit of bouncing back from a poor result with a very good one. 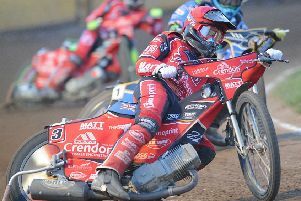 Captain Ulrich Ostergaard and eye-catching guest booking Nicklas Porsing (drafted in from Elite League outfit King’s Lynn for a first taste of Premier League racing) were the highest scorers in a fine all-round display with a dozen points apiece. Prolific reserve Simon Lambert was actually paid for more points than the Danish pair by piling up 10+3 at the bottom of the order and Michael Palm Toft added paid 11 on his return from a bout of chicken pox despite hitting the deck in one outing. There was also plenty of cause for celebration for two recent recruits. World Under 21 finalist Emil Grondal and Polish reserve Rafal Konopka both won their first races as Panthers rider - one success being quickly followed by another in the case of the excellent Grondal. Konopka’s heat two triumph earlier inspired a 4-2 which pulled Panthers immediately level after Sheffield guest star Edward Kennett had taken the opener. Kennett was the top individual on show with four wins. The only race he failed to win was the one in which he was deployed in search of double points in heat 11. He had no answer to Lambert and Palm Toft in that contest after a tight couple of opening bends as Panthers claimed the second of three successive 5-1s which allowed them to wrap up victory with three races to spare. Skipper Ostergaard and Grondal has triggered the burst by breezing home in heat 10 after simultaneously sweeping past Kevin Doolan and success was sealed by guest Porsing’s second triumph of the night in heat 12 when he had Lambert in tow. Kennett and visiting captain Garrity did claim advantages in two of the final three races (with some typically white-knuckle riding in the case of the latter) to deny Panthers’ their biggest victory of the season, but it was still arguably their most impressive. Allitt added: “We continue to be hit by injury problems, but also manage to pull rabbits out of the hat on a regular basis. “There were not a great deal of options where a guest was concerned after losing Lewis to injury the day before the meeting. Panthers return to action with two away tests in the space of 24 hours next weekend. A Saturday (July 24) trip to Workington is followed by a Sunday (July 25) visit to Glasgow. PANTHERS: Ulrich Ostergaard 12, Nicklas Porsing (guest) 12, Simon Lambert 10+3, Michael Palm Toft 8+3, Emil Grondal 8+1, Rafal Konopka 3, Rider replacement for Robert Lambert. SHEFFIELD: Edward Kennett (guest) 13, Jason Garrity 9+1, Arthur Sissis 5+1, Kevin Doolan 4 (guest), David Bellego 4, Josh Bates 2, Rider replacement for Ashley Birks.